The city is abuzz about La Centrale, Miami’s largest food hall dedicated to all things Italian. The massive 40,000-square-foot space, located inside the swanky Brickell City Centre, features nine unique restaurants, a full-service European market outfitted with nearly a dozen different stations and an upstairs wine bar and lounge. Here’s why you need to get there soon. Think of it as a haven of Italian culinary charm right smack in the middle of our tropical paradise. The sleek food hall, accentuated with gold, white and marble decor, puts our dream-kitchen Pinterest board to shame. Besides the fact that you’ll basically want to move in (why can’t our dining room look like that? ), brace yourself when you walk upstairs into the wine cellar—you’ll feel like you’ve entered a castle. 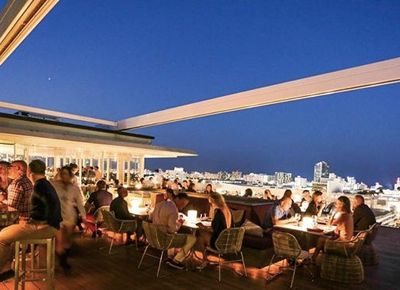 While some of the latest hot spots might have a reputation for being, shall we say, a bit bougie, this Brickell gem is anything but. You’ll hear the buzz of friends catching up, the crackling of ingredients as they hit the hot pan and the cozy kind of laughter usually reserved for decades-old neighborhood pubs. The third floor of La Centrale is a veritable vino paradise. You’ll love not only the carefully curated selection but also the fact that you can order by the glass or bottle, indulge in a wine flight (game changer) or opt for a paired tasting menu. As for cocktails, indulge your inner hipster snob with small-batch spirits, freshly squeezed juices, house-made infusions and bitters, and oh-so-unique garnishes (you know, for when a maraschino cherry just won’t do). Don’t forget, the wine shop includes more than 450 different labels and 4,000 bottles for actual sale. You know what that means: Grab a few to take home ASAP. Did we mention you can channel your inner chef by opting for an interactive cooking class? La Centrale’s third floor, next to the wine cellar, includes a demo kitchen that hosts classes on Italian cooking techniques, like an intro to Neapolitan pizza an aperitivo cocktail workshop. You can even book the space for a birthday party or special event. At its core, La Centrale is a market experience. Half the fun of a meal here is prowling the shelves for packaged goodies to take home later—artisanal cheeses, baskets of bread and bags of freshly made pasta. Oh, and before we forget: Did you absolutely love what you had to eat? Ask your server for a “grocery list” and check off the ingredients from your meal that you’d like to take home with you. Yep, dreams really do come true.